Rainbow Group has been founded with the aim of providing world class investing experience to hitherto underserved investor community. The technology today has made it possible to reach out to the last person in the financial market and give him the same level of service which was available to only the selected few. For Rainbow, Long term Relationship with our clients is the most important to achieve the business goal of the organization.we also maitain highest level of Transparency at our organization for maintaining ethical standard and entegrity. We give personalised Premium Services on: Equity, Derivatives, Commodities, Currency Broking, Mutual Fund, IPOs, Bonds,Fixed Deposit, National Pension Scheme and Depository Participant(CDSL). 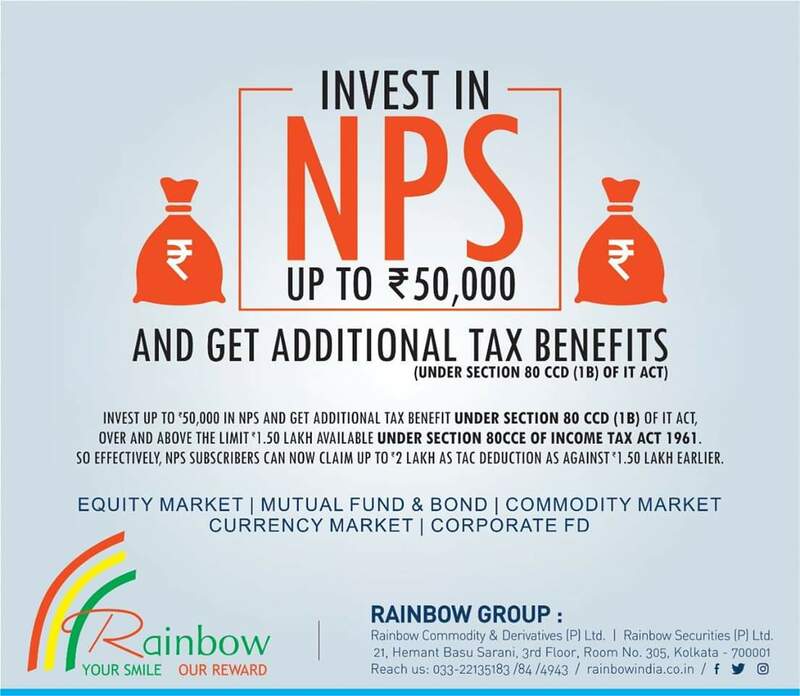 Your trading benefit comes together at Rainbow Group. Here you`ll find all you need to trade with smarter and convenient way,strategy analysis and professional support. So, no matter how multifaceted your strategy, we`ve got the solutions for smart investments. Whatever be your budget, whatever be your investment goals, there are expert investment plans, customized to suite your requirements, made specifically according to your need and taste. Shares are the most common and well known form of investment in the world. In simple terms, buying stocks (or equity) gives you part ownership or a 'share' in a business..
Mutual fund cannot guarantee either a return or wealth protection, particularly if it is a equity oriented fund. Choosing the right scheme of the right fund. A demat account is like a bank account for your securities or investments. The demat account contains your stocks, bonds, mutual fund units etc. in an electronic form. When a company issues equity to the public for the first time, it is called an Initial Public Offer (IPO). Quite understandably, the decision to invest. Reliance Industries surges with its telecom arm a..Apr-18-2019 03:27 PMHrs ISTReliance Industries is currently trading at Rs. 1384.00, up by 38.70 points or 2.88% from its previous closing of Rs. 1345.30 on the BSE.The scrip opened at Rs. 1365.45 and has touched a high and low.. 03:05Patel Integrated Logistics is currently trading at Rs. 54.50, up by 3.20 points or 6.24% from its previous closing of R.. 02:51Jubilant Life Sciences is currently trading at Rs. 694.25, up by 2.95 points or 0.43% from its previous closing of Rs... 02:35DCB Bank is currently trading at Rs. 204.70, up by 2.65 points or 1.31% from its previous closing of Rs. 202.05 on the..
P-notes investment jumps to Rs 78,110 crore at Ma..Apr-18-2019 09:19 AMHrs ISTWith positive market sentiments, the share of foreign portfolio investments (FPI) in domestic capit.. 09:18Easing concerns over farm and economic growth in the country, the India Meteorological Department (.. 09:17In order to deal with poverty and other challenges, Reserve Bank of India ( RBI) Governor Shaktikan.. 09:20The Reserve Bank of India (RBI) in its latest report has stated that banks closed fiscal 2018-19 (F..
Inflation goals of RBI need to be relooked: Rathi..Apr-18-2019 12:43 PMHrs ISTThe member of Prime Minister Narendra Modi's Economic Advisory Council, Rathin Roy has expressed th.. 10:34Niti Aayog CEO Amitabh Kant has said that India has been registering more than 7 percent Gross Dome.. 09:56The rating agency ICRA in its latest report has said that the issuance of government-fully serviced.. 09:37The World Steel Association in its latest report 'Short Range Outlook April 2019' has said India’s..
Nifty end in red; holds 11,750 markApr-18-2019 05:45 PMHrs ISTDomestic index S&P CNX Nifty ended the day’s trade in red terrain as market participants chose.. 05:35Nifty April 2019 futures closed at 11771.10 on Thursday, at a premium of 18.30 points over spot clo.. 09:36According to the data released by the NSE, the Foreign Institutional Investors (FIIs) were net buye.. 09:33Futures & Options (F&O) total turnover stood at Rs 10,54,523.93 crore on April 16 and the t..
Sterling and Wilson files DRHP with SEBI for IPO Apr-18-2019 02:29 PMHrs ISTSterling and Wilson has filed draft red herring prospectus (DRHP) with the market regulator Securit.. 02:50Shriram Properties has received markets regulator Securities and Exchange Board of India’s (SEBI) a.. 10:54V R Films & Studios V R Films & Studios is coming out with an initial public offering.. 02:25Annai Infra Developers has filed draft red herring prospectus (DRHP) with the market regulator Secu..
Reliance US Equity Opp F..
Edelweiss ETF - Nifty Ba..
ICICI Pru US Bluechip Eq..
ICICI Prudential MF declares dividend under FMP -..Apr-18-2019 02:07 PMHrs ISTICICI Prudential Mutual Fund (MF) has declared dividend under ICICI Prudential Fixed Maturity Plan.. 10:04ICICI Prudential Mutual Fund (MF) has launched the ICICI Prudential Fixed Maturity Plan-Series 86-1.. 02:23ICICI Prudential Mutual Fund (MF) has declared dividend under ICICI Prudential Fixed Maturity Plan.. 03:15ICICI Prudential Mutual Fund (MF) has declared dividend under ICICI Prudential Multiple Yield Fund..
We Recognize and Value the Equation of Our Relationship.Rainbow Believes in empowering and growing through our partner and alliances and expect them to live our values and grow philosophy. By teaming with us, you can orchestrate and deliver comprehensive packages of services to your clients, with ease and as per their needs. With our Experience and Expertise we will be able to offers the best services for wide range of products offerings including Equity, Derivatives, Commodities, Currency Broking, Mutual Fund, IPOs, Bonds,Fixed Deposit, National Pension Scheme and Depository Participant(CDSL). >Dedicated Support Desk to cater Service Support to BPs.